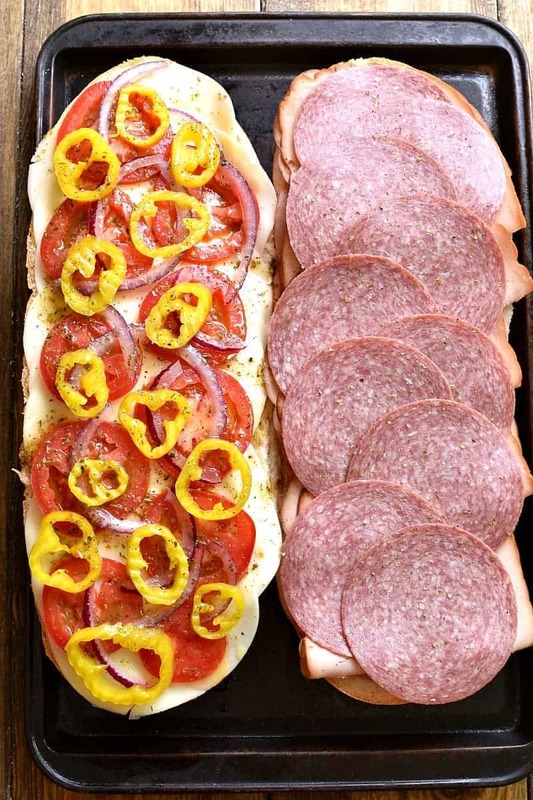 This Baked Italian Party Sub is perfect for feeding a crowd! 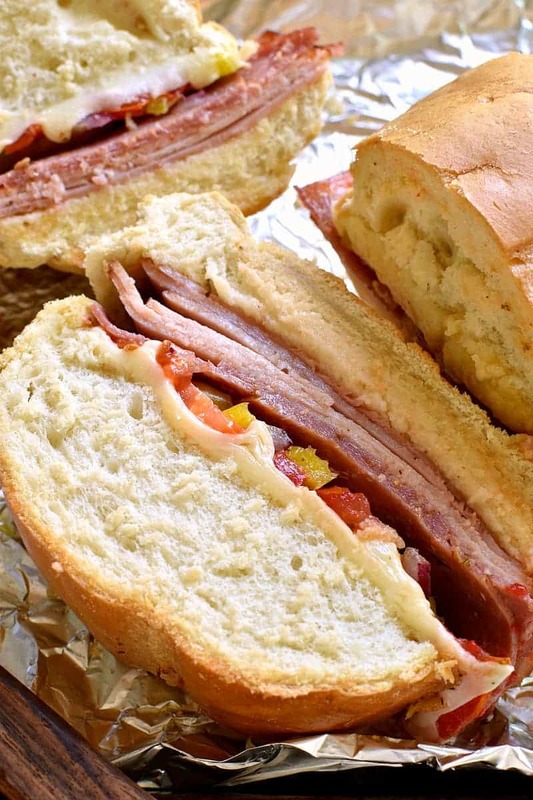 Loaded with the delicious flavors of salami, turkey, ham, provolone, tomatoes, peppers, red onions, and homemade Italian vinaigrette, this sandwich is party-ready whenever you are….and guaranteed to make all your guests very happy! So. The countdown is officially on. We’re a week and a half away from our annual summer birthday bash…..the huge party we have each year to celebrate the girls’ birthdays. And this year? I have the feeling it’s going to be bigger than ever. Because, well, this year we invited more people than ever. And so far, no one can’t make it. As for this year’s theme? It’s a carnival party! And it’s turning out to be so much fun. It was actually all Jorden’s idea…based on a recent trip to Six Flags with the two older girls. They came home with ALL the excitement and ALL the ideas…and ever since then we’ve been busy putting it into action. We have raffle tickets and carnival signs and kiddie pools and floating ducks and bottles and rings and cans and bean bags….the list goes on and on. We even have one of those cut out photo booths with holes for your head. Regardless, party prep is well underway. And now? The one thing we have left to consider is the FOOD! I’m not sure if we should go full on carnival food (think corn dogs and snow cones and cotton candy) or if we should make something everyone will actually enjoy. Like this Italian Party Sub! 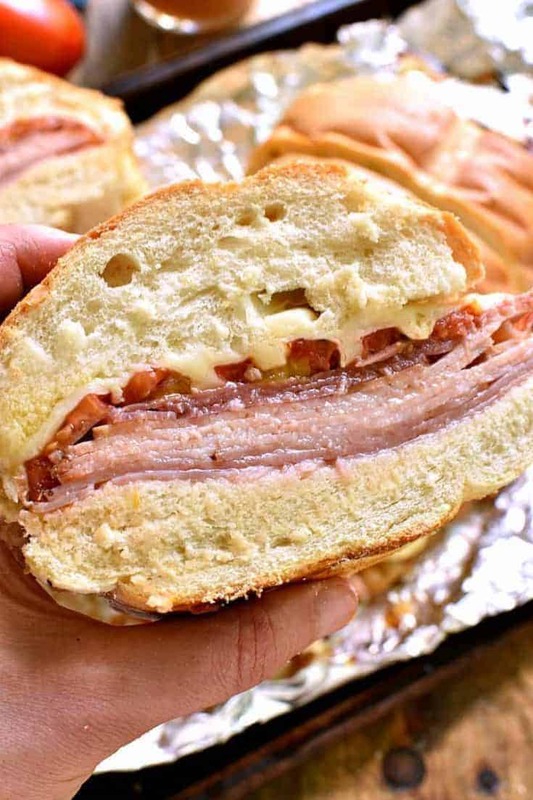 Sure, it might not match our carnival theme….but when a sandwich is loaded with salami and turkey and ham and provolone and veggies and Italian seasonings….you really can’t go wrong! 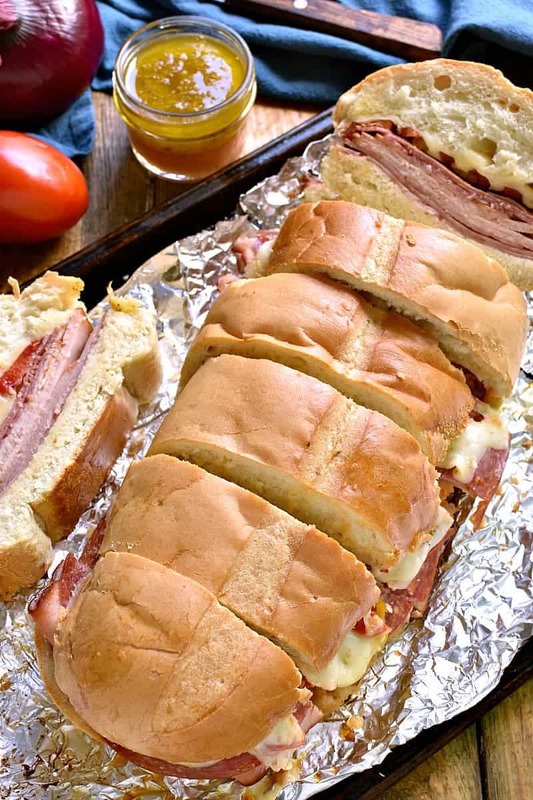 And this Italian Party Sub isn’t just for parties…it’s also ideal for game days, dinners, or weekend lunches. Simple, flavorful, and so much fun! I can see us making this Italian Party Sub all. the. time. And loving it! And once you try it for yourself? I have the feeling you’re going to love it too! 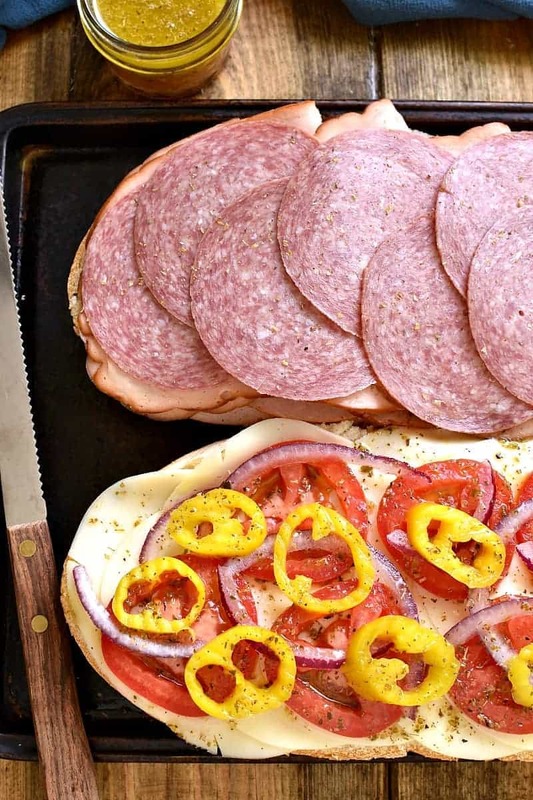 This Baked Italian Party Sub is perfect for feeding a crowd! 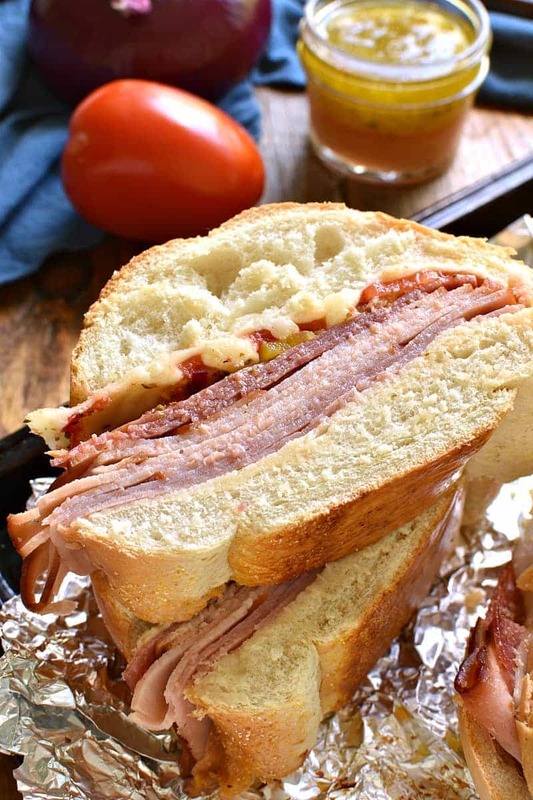 Loaded with the delicious flavors of salami, turkey, ham, provolone, tomatoes, peppers, red onions, and homemade Italian vinaigrette, this sandwich is party-ready whenever you are....and guaranteed to make all your guests very happy! Assemble sandwich by layering meat, cheese, and veggies. Combine dressing ingredients and whisk or shake well; drizzle over sandwich toppings. Close sandwich and wrap in foil. Bake at 350 degrees for 15-20 minutes or until cheese is fully melted. This sub sounds delish ! will have to make this the next lunch get together. I love these sandwiches but have never made my own. I always buy them out. I’m gonna give yours a try, it looks delicious! thanks! This would be great for our next party! Loving a good sub! This seriously looks like the perfect party sub! I’m totally into it! My husband is a football guy so this will be perfect for when we host game day! The sliced banana peppers just really sealed the deal for me, delicious! Party in my MOUTH! Loving this sub SO MUCH! A carnival party sounds super fun, and this sub will go over well, too, I’m sure! This would be good for upcoming tailgate parties, too! YUM! This sub is a perfect after-pool lunch or picnic food! My family will love it! I want to be invited to that party! As long as you’re serving this sub too! Wondering how far in advance you can make this sub? Can it sit in fridge for a whole day? And, if so, would you then put the dressing on just prior to baking? Any thoughts on making it ahead of time? Can this be served at a picnic? Will it taste good room temperature?